Here is the list of the hotels near Brénaz. Book your hotel near Brénaz today, Thursday 09 May for the best price, reservation and cancellation free of charge thanks to our partner Booking.com, leader in on-line hotels reservation. Below here is the list the 50 closest hotels of Brénaz, sortable according your criteria. You will find the position of these accommodations on the Brenaz hotels map. Gîte du Coq à l'Ane is located in Lompnieu and offers barbecue facilities, a garden and a terrace. This holiday home provides accommodation with free WiFi. This holiday home with mountain views features 1 bathroom with a shower. The kitchen comes with a dishwasher and an oven, as well as coffee machine and kettle. If you would like to discover the area, skiing is possible in the surroundings and the property can arrange a bicycle rental service. Aix-les-Bains is 47 km from the holiday home. The nearest airport is Chambéry-Savoie Airport, 57 km from Gîte du Coq à l'Ane. Situated in Lompnieu in the Rhône-Alps region, La Tête dans les Etoiles features a terrace and mountain views. This bed and breakfast provides barbecue facilities. The kitchenette is fitted with a microwave. Guests at the bed and breakfast can enjoy a continental breakfast. If you would like to discover the area, cycling and hiking are possible in the surroundings and a bicycle rental service can be arranged. Aix-les-Bains is 47 km from Du coq à l’Âne. The nearest airport is Chambéry-Savoie Airport, 57 km from the accommodation. Located in Champagne-en-Valromey, VAL'RELEY offers accommodation with free WiFi and access to a garden. The units have a fully equipped kitchenette with an oven and a toaster. Breakfast is available each morning, and includes continental, vegetarian and gluten-free options. Skiing is possible within the area and the bed and breakfast offers ski storage space. Aix-les-Bains is 37 km from VAL'RELEY. The nearest airport is Chambéry-Savoie Airport, 43 km from the property. Providing barbecue facilities, Domaine du Valromey provides accommodation in Champagne-en-Valromey. Complimentary WiFi is provided. A terrace with mountain views is offered in every unit. A continental breakfast is served each morning at the property. The bed and breakfast offers an outdoor pool. Cycling can be enjoyed nearby. Aix-les-Bains is 37 km from Domaine du Valromey. The nearest airport is Chambéry-Savoie Airport, 43 km from the property. Featuring free WiFi, Gite du Cret is a holiday home, situated in Hotonnes in the Valromey region. You can relax by the seasonal outdoor pool in the garden in fair weather. The Plans d 'Hotonnes Ski Station is 6 km away. The kitchen has a dishwasher, an oven and a microwave, as well as a coffee machine and a kettle. A flat-screen TV is featured. Other facilities at Gite du Cret include a barbecue. Geneva is 42 km from Gite du Cret, while Annecy is 35 km from the property. An array of activities are offered in the area, such as skiing and hiking. The nearest airport is Chambéry-Savoie Airport, 43 km from Gite du Cret. Boasting a garden and a shared lounge, La Maria is set in Cormaranche-en-Bugey. The guest house offers a French restaurant. At the guest house, every room is fitted with a terrace. Certain rooms are equipped with a kitchenette with a microwave, a toaster and a stovetop. All units feature a desk. A continental breakfast is available daily at the property. La Maria offers a children's playground. An array of activities are offered in the area, such as skiing and hiking. The nearest airport is Chambéry-Savoie Airport, 60 km from the accommodation. Featuring a shared lounge and free WiFi, Hotel Michallet is situated in Artemare. This 2-star hotel offers a bar. Rooms are fitted with a flat-screen TV with satellite channels. Rooms are equipped with a private bathroom. A continental breakfast is available daily at the hotel. Hotel Michallet offers a sun terrace. Aix-les-Bains is 34 km from the accommodation. The nearest airport is Chambéry-Savoie Airport, 40 km from Hotel Michallet. Offering free WiFi and mountain views, Maison de village. Is an accommodation set in Artemare. The property has river views. The holiday home consists of 2 separate bedrooms, 1 bathroom, and a seating area. Aix-les-Bains is 34 km from the holiday home, while Chambéry is 49 km away. Chambéry-Savoie Airport is 40 km from the property. Hôtel Le Hauteville is offering accommodation in Hauteville-Lompnes. Around 2.3 km from Ecole, the property is also 2.4 km away from Terre Ronde and offers free WiFi. Grand Couloir is 2.7 km from the hotel and La Praille is 5 km away. All rooms in the hotel are fitted with a kettle. The rooms are equipped with a private bathroom with a bath and free toiletries. Guest rooms include a desk. Hauteville is 2.7 km from Hôtel Le Hauteville. The nearest airport is Chambéry-Savoie Airport, 63 km from the property. Chambres D'Hotes La Maison Des Chiens Verts offers B&B accommodation in Hauteville-Lompnes. This property features a terrace, a garden and a sauna. All rooms offer a flat-screen TV with cable channels, a minibar, a seating area and free Wi-Fi access. The private bathrooms are complete with bath or shower, toilet and hairdryer. Breakfast including hot drinks and pastries is included and additional breakfast options are available upon request. A variety of activities can be enjoyed on site or in the surroundings, including skiing, horse riding, cycling and hiking. The property offers free parking. Activ'Plein Air is an accommodation situated in Hotonnes, 100 metres from Les Plans d'Hotonnes Ski School and 500 metres from Les Plans d'Hotonnes. Complimentary WiFi is available. The holiday home is equipped with 2 bedrooms, a fully equipped kitchenette with an oven, and 1 bathroom with a shower. The nearest airport is Chambéry-Savoie Airport, 70 km from the holiday home. Within 2.8 km of Ecole and 2.9 km of Terre Ronde, La rencontre provides free WiFi and ski-to-door access. The Grand Couloir is within 3.2 km of the holiday home. The holiday home includes 3 bedrooms and a kitchen with an oven and a coffee machine. A flat-screen TV is available. The holiday home offers a terrace. A casino is available at La rencontre, while guests can also relax in the garden. La Praille is 6 km from the accommodation. The nearest airport is Chambéry-Savoie Airport, 63 km from the property. Set 600 metres from Les Plans d'Hotonnes Ski School in Hotonnes, La Grange Des Plans offers accommodation with a kitchen. The Les Plans d'Hotonnes is within 1 km of the holiday home. The holiday home has a TV. Chambéry-Savoie Airport is 70 km away. Located in Hotonnes in a renovated farm house, Gites les Pelaz offers bed and breakfast accommodation just 1 km from the ski slopes. A two-bedroom apartment and a studio are available. Both accommodations feature a terrace with mountain views, a flat-screen TV and a private bathroom with a shower and toilet. Free Wi-Fi is available throughout. A continental breakfast is served daily and an evening meal can be provided upon request. Each kitchen includes a stove, oven, refrigerator and microwave. Gites les Pelaz is situated 31 km from Bellegarde-sur-Valserine. Bourg-en-Bresse Train Station is 64 km away. Located in Serrières-en-Chautagne in the Rhône-Alps region, La Terre has a terrace. Guests staying at this holiday home have access to a fully equipped kitchen. The holiday home comes with a TV and 1 bedroom. The holiday home offers an outdoor pool. Guests can relax in the garden at the property. Annecy is 39 km from La Terre. The nearest airport is Chambéry-Savoie Airport, 32 km from the property. Du Soleil is located in Serrières-en-Chautagne and offers a garden. Guests may enjoy the free WiFi. This air-conditioned holiday home comes with 3 bedrooms, a TV, and a kitchen with a dishwasher. The holiday home offers an outdoor pool. Annecy is 39 km from Du Soleil Serrieres, while Aix-les-Bains is 26 km from the property. The nearest airport is Chambéry-Savoie Airport, 32 km from the property. Salon Du Jardin is located in Serrières-en-Chautagne and offers a garden. Guests staying at this holiday home have access to a terrace. The 2-bedroom holiday home is equipped with a living room with TV, and a fully equipped kitchen with dishwasher. The holiday home offers an outdoor pool. Annecy is 39 km from Salon Du Jardin. Chambéry-Savoie Airport is 32 km away. Set in Serrières-en-Chautagne in the Rhône-Alps region, De La Tour features a garden. The holiday home offers an outdoor pool and free WiFi. The holiday home comes with 2 bedrooms and a fully fitted kitchen with a microwave and a fridge. A TV is available. Annecy is 39 km from Tour Serrieres Chautagne, while Aix-les-Bains is 26 km away. Chambéry-Savoie Airport is 32 km from the property. Grand Salon is situated in Serrières-en-Chautagne. Guests staying at this holiday home have access to free WiFi and a fully equipped kitchen. The holiday home is fitted with a TV and 2 bedrooms. The holiday home offers an outdoor pool. Guests can relax in the garden at the property. Annecy is 39 km from Grand Salon Serrieres, while Aix-les-Bains is 26 km from the property. Chambéry-Savoie Airport is 32 km away. La Chapelle is set in Serrières-en-Chautagne and offers a garden and a terrace. Guests have access to free WiFi. The holiday home includes 2 bedrooms and a kitchen with a dishwasher and an oven. A TV is offered. The holiday home offers an outdoor pool. Annecy is 39 km from Hol Home La Chapelle. The nearest airport is Chambéry-Savoie Airport, 32 km from the accommodation. Apartment La Luna 1 is set in Serrières-en-Chautagne. The holiday home provides an outdoor pool and free WiFi. The holiday home has a TV and 3 bedrooms. The air-conditioned accommodation is fitted with a kitchen. Guests can relax in the garden at the property. Annecy is 39 km from Luna Serrieres Chautagne, while Aix-les-Bains is 26 km away. The nearest airport is Chambéry-Savoie Airport, 32 km from the property. Offering a garden, Gîte de pouvillieu is located in the mountains in Cérarge, 45 km from Annecy. Aix-les-Bains is 39 km from the property. Free WiFi is available and free private parking is available on site. All units include a flat-screen TV. Some units have a seating area and/or terrace. There is also a dining area and a kitchenette equipped with a microwave, a toaster, and a fridge. A stovetop is also offered, as well as a coffee machine and a kettle. Every unit is equipped with a private bathroom with a shower and free toiletries. Towels and bed linen are provided. Gîte de pouvillieu also includes a sun terrace. You can engage in various activities, such as cycling and hiking. Chambéry is 50 km from Gîte de pouvillieu. Lyon - Saint Exupery Airport is 43 km away. Le Doux Nid B&B is set along the banks of the Savières Canal, in a former coaching inn built in the 18th-century in the scenic village of Chanaz. Free WiFi is available and free private parking is provided nearby. Each individually decorated room includes a flat-screen TV, an electric kettle and a microwave. Every room also has a private bathroom fitted with a shower. Continental breakfast is served daily. You can also enjoy evening meals prepared by the hosts on request. Guests can explore the town centre or tour the canal by boat. Chanaz is also known as the Savoyard Little Venice, thanks to the canal. Situated in Chanaz, Le Belvue features accommodation with a private pool and free WiFi. This bed and breakfast offers barbecue facilities. This bed and breakfast comes with a kitchen, a seating area, a dining area and a satellite flat-screen TV. A continental breakfast is available each morning at the bed and breakfast. LE BELVUE offers a terrace. Guests at the accommodation can enjoy cycling nearby, or make the most of the garden. Annecy is 43 km from Le Belvue, while Aix-les-Bains is 23 km from the property. The nearest airport is Chambéry-Savoie Airport, 29 km from the property. Located in Evosges, L'Auberge Campagnarde features a seasonal outdoor swimming pool. This 3-star hotel offers a shared lounge and free WiFi. The property features a children's playground. All guest rooms in the hotel are equipped with a TV. Rooms are complete with a private bathroom, while some rooms at L'Auberge Campagnarde also have a balcony. The units include a wardrobe. A continental breakfast is available daily at the property. Guests can enjoy a meal at the in-house restaurant, which serves a variety of French dishes. The accommodation offers a terrace. You can play table tennis at this 3-star hotel. The nearest airport is Chambéry-Savoie Airport, 66 km from the property. Located in Chanaz, Auberge de Portout offers accommodation with free WiFi and TV, as well as a garden and a bar. There is a fully equipped private bathroom with shower and free toiletries. Guests at the bed and breakfast can enjoy a continental breakfast. Auberge de Portout offers a children's playground. This property provides a sun terrace. Annecy is 39 km from the accommodation, while Aix-les-Bains is 20 km away. Chambéry-Savoie Airport is 25 km from the property. This Logis is located in the village Aranc in the Bugey Mountains. It offers guestrooms with free Wi-Fi internet access for up to 6 guests and free onsite parking. The restaurant in the Logis Aranc Evasion serves local and regional cuisine made with local products. It also offers an extensive wine list to accompany your meals. Local activities in the area include skiing, hiking, mountain biking and more. Children will enjoy the nearby playground. Guest accommodation La Burbanche Preferred hotel ! L'Horizon is a holiday home situated in La Burbanche, in a private setting surrounded by nature. 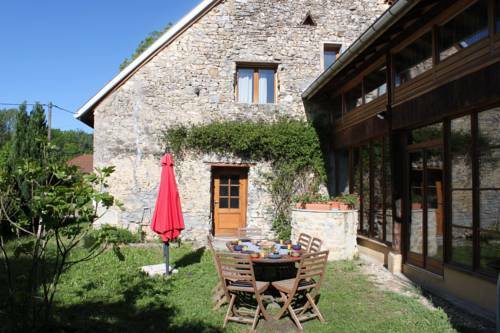 The property is 80 km from Annecy and boasts mountain views from an altitude of 650 metres. Free private parking is available on site. There is a seating area and a kitchen. Towels and bed linen are featured at L'Horizon. Other facilities at L'Horizon include a barbecue. The area is popular for horse riding and fishing, and includes a number of waterfalls, lakes, caves and other natural sites. Chambéry is 67 km from L'Horizon, while Bourg-en-Bresse is 60 km from the property. Aix-les-Baines is 61 km away. The nearest airport is Chambéry-Savoie Airport, 59 km from the property. Boasting a seasonal outdoor swimming pool, Domaine Des Pierrots offers accommodation in Chindrieux with free WiFi and mountain views. Guests are welcome to go for a swim in the private pool. The villa includes a kitchen with a dishwasher and an oven, as well as a coffee machine. A flat-screen TV and Blu-ray player are available. The villa offers a barbecue. DOMAINE DES PIERROTS features a terrace. Annecy is 35 km from the accommodation. The nearest airport is Chambéry-Savoie Airport, 22 km from Domaine Des Pierrots. With an indoor pool and a restaurant, Domitys Les Deux Lacs is located in Rumilly, just 250 metres from the Train Station. This senior residence offers free internet access, a shared living area and a garden. Serviced by a lift, each heated apartment includes a seating area with a sofa and a flat-screen TV. The bathroom offers free toiletries. The apartment’s kitchen includes a stove, a fridge and a microwave. The on-site restaurant serves a continental breakfast every morning. Traditional meals can also be enjoyed every evening and guests can have a drink at the bar. Domitys Les Deux Lacs has a fitness room and a library. Facilities for guests with reduced mobility are available and free private parking is provided on site. One-Bedroom Apartment in St Pierre de Curtille is located in Conjux. This apartment also features free WiFi. This apartment is fitted with a living room and a fully equipped kitchen. Annecy is 44 km from the apartment. The nearest airport is Chambéry-Savoie Airport, 24 km from One-Bedroom Apartment in St Pierre de Curtille. Sweet Home is located in Belley in eastern France, between Grenoble and Geneva. Free Wi-Fi is available and guests can take advantage of the express check-in and check-out terminal. Sweet Home provides comfortable rooms with an en suite bathroom and flat-screen TV with satellite channels. Sweet Home’s restaurant Zest, is open for lunch and dinner and features an urban theme. It includes a self-service buffet, including salads, hot dishes, desserts and ice cream. Sweet Home is just 34 km from Chambery and 15 km from both Lake Bourget and Aix-les-Bains. Annecy and Lyon are just under an hour's drive from the property. Located in Rumilly just 3 km away from the train station, Couett' Hotel Rumilly offers a terrace, a 24-hour front desk and free Wi-Fi. Aix-les-Bains is 17 km away and Annecy is 15 km away. The air-conditioned rooms at Couett' Hotel Rumilly are modern and some have access to a private terrace. They are all equipped with a TV and a bathroom with shower and separate toilet. Every morning, guests can enjoy the breakfast buffet. They can also relax and have a drink at the bar or sample the food of the restaurant located nearby. Free private parking and a children’s playground are available on site. Guests can drive 18.3 km to Clermont Castle or 21.3 to Montrottier Castle. Station de Savoie Grand Revard Ski Resort is 36.5 km away. Located in the centre of Belley, Au Saint Jean offers B&B accommodation with traditional French décor. There is a garden and the Bugey Vineyards are just 3 km away. All rooms feature views of the garden and town, a wardrobe and a desk. The en suite bathroom is complete with free toiletries. A continental breakfast serving fresh bread and French pastries is provided each morning at Au Saint Jean. Guests can sample the local cuisine in the town’s restaurants, within 300 metres of the property. Via Ferrata Trails are located 20 km away in Tenay and Le Bourget Lake is a 30-minute drive from the B&B. Free Wi-Fi access is available in the guest rooms and free private parking is possible on site. Set in Belley, 32 km from Aix-les-Bains, La ferme de Coron features a shared lounge and free WiFi. A buffet breakfast is available daily at the property. The bed and breakfast offers a sun terrace. Chambéry is 34 km from La ferme de Coron. The nearest airport is Chambéry-Savoie Airport, 27 km from the property. Below here is the hotels map of Brénaz. Names and details of Brénaz hotels can be shown on the map clicking on the prices icons.